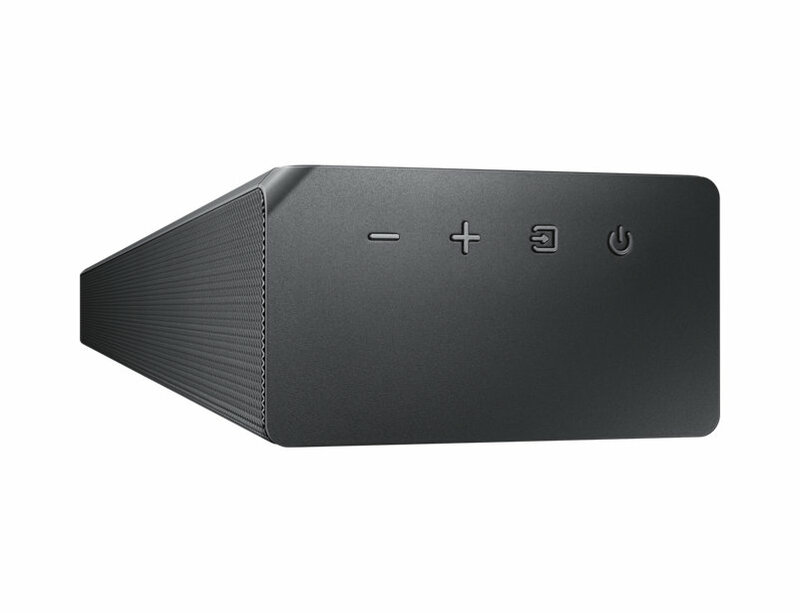 The HW-MS550 from Samsung's array of home audio solutions promises to live up to its ‘all-in-one’ expectations with HD+ Audio, Bluetooth and Wi-Fi connectivity, and multi-speaker control technology. It even poises to provide a much-cheaper-yet-still-better alternative to its sibling, the Samsung HW-MS650. But does this audio equipment deliver really well? Samsung’s HW-MS550 has a solidly-built design fitting enough to be placed under at least a 40-inch television. When connected through HDMI, the soundbar can alleviate the ‘home theater-like feel’ inside the living room with sound modes programmed according to your preference. Plus, setting up is an easy affair. It comes with four consoles plus a remote that lets you control the soundbar, from its bass and treble settings, to the volume, and configuring the sources. With Bluetooth connectivity, the HW-MS550 provides a connectivity range of up to ten meters in distance. Imagine hearing it playing the sounds from your device in the other room with lesser frills in the process. However, the usual delays from this wireless connection could span for up to around three seconds, and it may feel a bit inconvenient for the players, especially when watching movies. Hey, who likes to see your favorite flicks with a distorted audio, right? The soundbar has five audio modes and the results were quite okay to be staged inside a room and fill the space. At least, each one of them showcased the clear-cut separation of left and right. However, some were struggling to level up and hear the other details (such as the bass, tweeters, and mids) that should’ve been a clear-cut and refined from the get-go. Still, its six drivers can run the noise in high-definition for the entirety of the room and at least inject the feel of being inside a movie theater, music hall, or even a sports stadium. It can go even louder by activating the surround sound mode and play accordingly with the smart mode. But the ‘vocal-only’ sound mode appears to confuse the hell out of us at first. It’s like hearing the low bit-rate version of a track that you are listening to regardless of how loud the vocal amplifications were evident. While that bass part delivered relatively-good, it still felt lacking in depth compared to an audio appliance with a typical subwoofer as part of the lineup. Having one could’ve compliment the system more. Plus, it still struggled to come through on some tracks. It could be drubbing and thumb-thumping but at the same time, wobbly when playing the not-so-refined bass lines. Same with the mids and acoustics. The Samsung HW-MS550 is the soundbar that poises to be the all-in-one soundbar that the tech giant can offer at a more affordable price, and still boasting the features nearly the same as its predecessor. Its impressive range and sound boost make it up for a sleek-looking appliance that lacks the further, needed details on showcasing the full-blown auditory pleasure. Certainly, a cheap alternative from Samsung itself but doesn't necessarily translate to a richer and superior listening experience. As part of the Bigger and Brighter Holidays nationwide promo, Samsung Philippines is offering select soundbar models and television units with discounts of up to 40% until January 31, 2018. Click the link for more details.